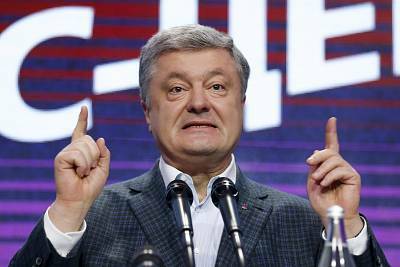 With nearly 90 percent of the ballots counted by Monday afternoon, Volodymyr Zelensky, 41, had a 14 percent lead on President Petro Poroshenko — a wide gap that beat all expectations. Talking to cheering supporters after his lead became apparent on Sunday, Zelensky thanked Ukrainians for not casting their ballots "just for fun." 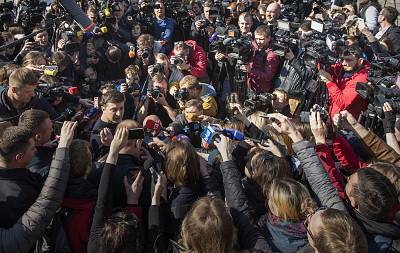 "This is only the first step toward a great victory," said Zelensky, who has never held political office. The comedian, who led opinion pollsthroughout the election campaign, has vowed to enact anti-corruption reforms and make Ukrainians "prosperous." He has also promised to end the war with pro-Russian separatists in the east of the country. "You don't need experience to be president, you just need to be a decent human being," was a mantra repeated by him and his aides. Zelensky and Poroshenko looked set to clash in the second round run-off on April 21, where things could get heated, according to a Kiev-based political strategist Olexiy Golobutskiy. The race will likely become "much more rough" in this next stage of campaigning, Golobutskiy said. "It's not easy to make up a gap of more than 10 percent." Most opinion polls released before the election predicted that Zelensky would beat any candidate who faces him in the runoff. "Poroshenko's campaign will also be faced with the task of demotivating the voters who voted for Zelensky," Golobutskiy said. 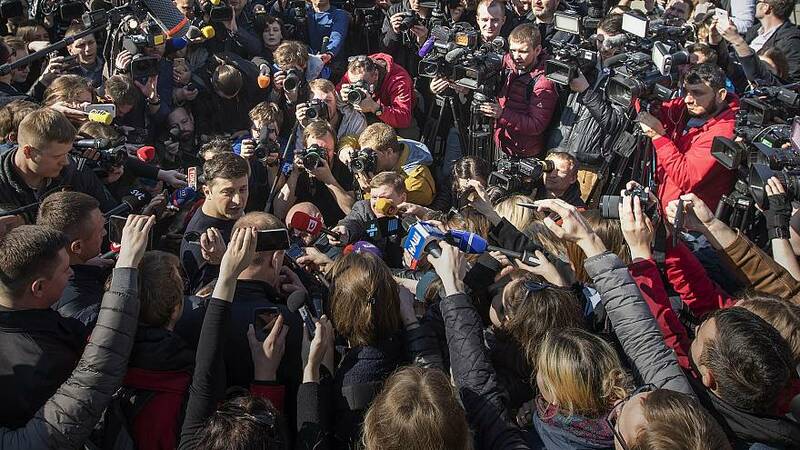 Zelensky's lack of political experience and vague policies have left many wondering how he would fare as president of a nation that has been at war ever since mass protests ousted a pro-Kremlin government in 2014. Emily Ferris, a Russia research fellow at London-based think tank Royal United Services Institute, said voters' behavior can be unpredictable and many may opt out for continuity when faced with a choice between Poroshenko and "an unknown alternative" in the runoff. He then called Zelensky "a puppet of oligarch Igor Kolomoyskyi," and said that Russian President Vladimir Putin "dreams of a soft, meek, compliant, giggling, inexperienced and weak, ideologically amorphous and politically undecided president of Ukraine." Balázs Jarábik, a non-resident scholar at the Carnegie Endowment for International Peace, predicted that Poroshenko will continue portraying Zelensky as someone who will cozy up to the Kremlin in the weeks to come. The comedian had previously said that he was ready to negotiate directly with Putin if that meant ending the conflict in the east. "Such a polarizing campaign though is one of the reasons why many Ukrainians support Zelensky," Jarábik added. Despite some reports of irregularities, most experts and observers deemed Sunday's election transparent and fair, with over 63 percent turning up to vote — higher than after 2014 protests that shook the country. "Many Ukrainians felt that saying 'No' to the old system, represented by Poroshenko and [Yulia] Tymoshenko is very important," he said, referring to the nationalist former prime minister who placed third with 13.2 percent. It "is very good news for Ukraine's democracy," he added.